In the G Code prototypes the hyphen (-) stands for a real value. In most cases, if axis words (any or all of X-, Y-, Z-, A-, B-, C-, U-, V-, W-) are given, they specify a destination point. Axis numbers are in the currently active coordinate system, unless explicitly described as being in the absolute coordinate system. Where axis words are optional, any omitted axes will have their current value. Any items in the G Code prototypes not explicitly described as optional are required. The values following letters are often given as explicit numbers. Unless stated otherwise, the explicit numbers can be real values. For example, G10 L2 could equally well be written G[2*5] L[1+1]. If the value of parameter 100 were 2, G10 L#100 would also mean the same. If L- is written in a prototype the "-" will often be referred to as the "L number", and so on for any other letter. In Absolute Mode the distance and angle is from the XY zero position and the angle starts with 0 on the X Positive axis and rotates in a CCW direction about the Z axis. The code G1 @1^90 is the same as G1 Y1. You can see from the following figure that the output is not what you might expect. Because we added .5 to the distance each time the distance from the XY zero position increased with each line. For rapid linear (straight line) motion, program G0 axes, where all the axis words are optional. The G0 is optional if the current motion mode is G0. This will produce coordinated linear motion to the destination point at the current traverse rate (or slower if the machine will not go that fast). It is expected that cutting will not take place when a G0 command is executing. If cutter radius compensation is active, the motion will differ from the above; see Section [->]. If G53 is programmed on the same line, the motion will also differ; see Section [.]. An axis letter is without a real value. For linear (straight line) motion at programed feed rate (for cutting or not), program G1 axes, where all the axis words are optional. The G1 is optional if the current motion mode is G1. This will produce coordinated linear motion to the destination point at the current feed rate (or slower if the machine will not go that fast). No feed rate has been set. A circular or helical arc is specified using either G2 (clockwise arc) or G3 (counterclockwise arc). The direction (CW, CCW) is as viewed from the positive end of the axis about which the rotation occours. The axis of the circle or helix must be parallel to the X, Y, or Z-axis of the machine coordinate system. The axis (or, equivalently, the plane perpendicular to the axis) is selected with G17 (Z-axis, XY-plane), G18 (Y-axis, XZ-plane), or G19 (X-axis, YZ-plane). Planes 17.1, 18.1, and 19.1 are not currently supported. If the arc is circular, it lies in a plane parallel to the selected plane. If a line of code makes an arc and includes rotational axis motion, the rotational axes turn at a constant rate so that the rotational motion starts and finishes when the XYZ motion starts and finishes. Lines of this sort are hardly ever programmed. If cutter radius compensation is active, the motion will differ from what is described here. See Section [->]. Two formats are allowed for specifying an arc: Center Format and Radius Format. In the center format, the coordinates of the end point of the arc in the selected plane are specified along with the offsets of the center of the arc from the current location. In this format, it is OK if the end point of the arc is the same as the current point. When programming arcs using a precision of less than 4 decimal places (0.0000) for inch and less than 3 decimal places (0.000) for millimeters can result in error due to rounding. When the arc is projected on the selected plane, the distance from the current point to the center differs from the distance from the end point to the center by more than (.05 inch/.5 mm) OR ((.0005 inch/.005mm) AND .1% of radius). The axis words are all optional except that at least one of X and Y must be used to program an arc of less than 360 degrees. I and J are the offsets from the current location (in the X and Y directions, respectively) of the center of the circle. I and J are optional except that at least one of the two must be used. If only one is specified, the value of the other is taken as 0. If you include the Z word it will spiral. I and J are both omitted. The axis words are all optional except that at least one of X and Z must be used to program an arc of less than 360 degrees. I and K are the offsets from the current location (in the X and Z directions, respectively) of the center of the circle. I and K are optional except that at least one of the two must be used. If only one is specified, the value of the other is taken as 0. In Diameter Mode G7 I & K are still radius dimensions. I and K are both omitted. The axis words are all optional except that at least one of Y and Z must be used to program an arc of less than 360 degrees. J and K are the offsets from the current location (in the Y and Z directions, respectively) of the center of the circle. J and K are optional except that at least one of the two must be used. If only one is specified, the value of the other is taken as 0. J and K are both omitted. Calculating arcs by hand can be difficult at times. One option is to draw the arc with a cad program to get the coordinates and offsets. Keep in mind the tolerance mentioned above, you may have to change the precision of your cad program to get the desired results. Another option is to calculate the coordinates and offset using formulas. As you can see in the following figures a triangle can be formed from the current position the end position and the arc center. In the following figure you can see the start position is X0 Y0, the end position is X1 Y1. 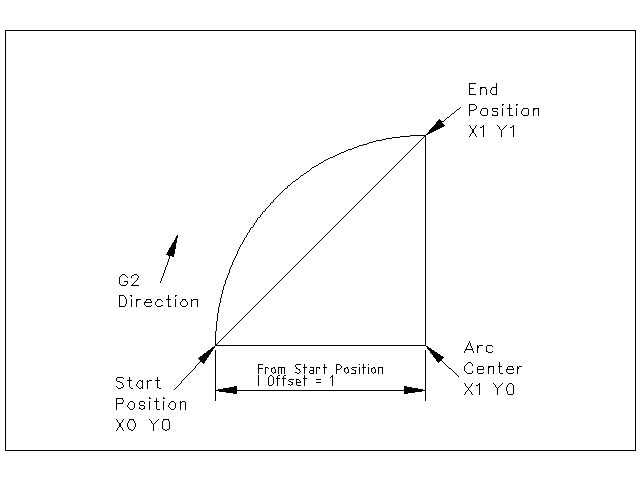 The arc center position is at X1 Y0. This gives us an offset from the start position of 1 in the X axis and 0 in the Y axis. In this case only an I offset is needed. In the next example we see the difference between the offsets for Y if we are doing a G2 or a G3 move. For the G2 move the start position is X0 Y0, for the G3 move it is X0 Y1. The arc center is at X1 Y0.5 for both moves. 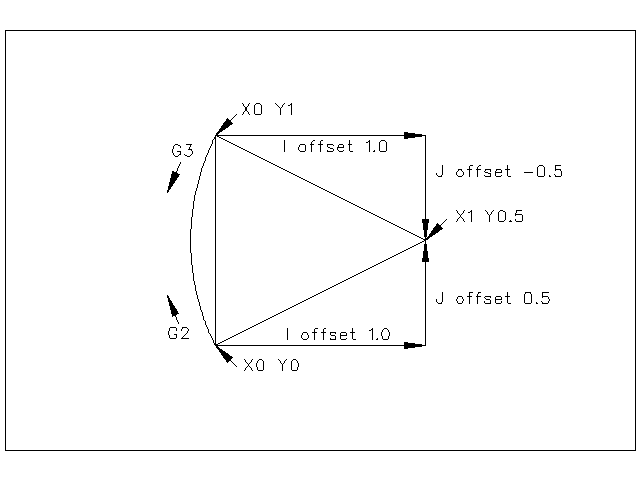 The G2 move the J offset is 0.5 and the G3 move the J offset is -0.5. G17 G2 X10 Y16 I3 J4 Z9. That means to make a clockwise (as viewed from the positive z-axis) circular or helical arc whose axis is parallel to the Z-axis, ending where X=10, Y=16, and Z=9, with its center offset in the X direction by 3 units from the current X location and offset in the Y direction by 4 units from the current Y location. If the current location has X=7, Y=7 at the outset, the center will be at X=10, Y=11. If the starting value of Z is 9, this is a circular arc; otherwise it is a helical arc. The radius of this arc would be 5. In the center format, the radius of the arc is not specified, but it may be found easily as the distance from the center of the circle to either the current point or the end point of the arc. To do a full 360 circle from the current location only program the I, J or K offset from the current location for the G2/3. To program a 360 degree spiral in the XY plane just include the Z word. In the radius format, the coordinates of the end point of the arc in the selected plane are specified along with the radius of the arc. Program G2 axes R- (or use G3 instead of G2). R is the radius. The axis words are all optional except that at least one of the two words for the axes in the selected plane must be used. The R number is the radius. A positive radius indicates that the arc turns through less than 180 degrees, while a negative radius indicates a turn of more than 180 degrees. If the arc is helical, the value of the end point of the arc on the coordinate axis parallel to the axis of the helix is also specified. the end point of the arc is the same as the current point. It is not good practice to program radius format arcs that are nearly full circles or nearly semicircles because a small change in the location of the end point will produce a much larger change in the location of the center of the circle (and, hence, the middle of the arc). The magnification effect is large enough that rounding error in a number can produce out-of-tolerance cuts. For instance, a 1% displacement of the endpoint of a 180 degree arc produced a 7% displacement of the point 90 degrees along the arc. Nearly full circles are even worse. Other size arcs (in the range tiny to 165 degrees or 195 to 345 degrees) are OK. Here is an example of a radius format command to mill an arc: G17 G2 x 10 y 15 r 20 z 5. That means to make a clockwise (as viewed from the positive Z-axis) circular or helical arc whose axis is parallel to the Z-axis, ending where X=10, Y=15, and Z=5, with a radius of 20. If the starting value of Z is 5, this is an arc of a circle parallel to the XY-plane; otherwise it is a helical arc. For a dwell, program G4 P- . This will keep the axes unmoving for the period of time in seconds specified by the P number. the P number is negative. 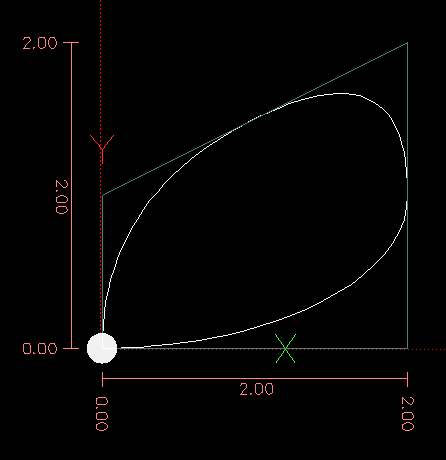 G5.1 creates a quadratic B-spline in the XY plane with the X and Y axis only. Warning: G5.2, G5.3 is experimental and not fully tested. G5.2 is for opening the data block defining a NURBs and G5.3 for closing the data block. In the lines between these two codes the curve control points are defined with both their related "weights" (P) and their parameter (L) which determines the order of the curve (k) and subsequently its degree (k-1). Using this curve definition the knots of the NURBs curve are not defined by the user they are calculated by the inside algorithm, in the same way as it happens in a great number of graphic applications, where the curve shape can be modified only acting on either control points or weights. Program G7 to enter the diameter mode for axis X on a lathe. When in the Diameter mode the X axis moves on a lathe will be 1/2 the distance to the center of the lathe. For example X1 would move the cutter to 0.500” from the center of the lathe thus giving a 1” diameter part. Program G8 to enter the radius mode for axis X on a lathe. When in Radius mode the X axis moves on a lathe will be the distance from the center. Thus a cut at X1 would result in a part that is 2" in diameter. G8 is default at power up. Program a G10 L1 to set a tool table entry from a program or the MDI window. G10 L1 reloads the tool table. The coordinate system is described in Section[->]. To set the origin of a coordinate system, program G10 L2 P- R- axes, where the P number is in the range 1 to 9 (corresponding to G54 to G59.3) and optionally R to indicate the rotation of the XY axis around the Z and all axis words are optional. The origin of the coordinate system specified by the P number is set to the given values (in terms of the not offset machine coordinate system). Only those coordinates for which an axis word is included on the line will be set. Being in incremental distance mode (G91) has no effect on G10 L2. The direction of rotation is CCW as viewed from the Top View. G10 L2 Pn does not change from the current coordinate system to the one specified by P, you have to use G54-59.3 to select a coordinate system. When a rotation is in effect jogging an axis will only move that axis in a positive or negative direction and not along the rotated axis. The P number does not evaluate to an integer in the range 1 to 9. An axis is programmed that is not defined in the configuration. If a G92 origin offset was in effect before G10 L2, it will continue to be in effect afterwards. The coordinate system whose origin is set by a G10 command may be active or inactive at the time the G10 is executed. If it is currently active, the new coordinates take effect immediately. sets the origin of the first coordinate system (the one selected by G54) to be X=3.5 and Y=17.2. Because only X and Y are specified, the origin point is only moved in X and Y; the other coordinates are not changed. sets the G54 coordinate back to the origin. G10 L10 is just like G10 L1 except that instead of setting the offset/entry to the given value, it is set to a calculated value that makes the current coordinates become the given value. G10 L20 is similar to G10 L2 except that instead of setting the offset/entry to the given value, it is set to a calculated value that makes the current coordinates become the given value. Program G20 to use inches for length units. Program G21 to use millimeters for lenght units. It is usually a good idea to program either G20 or G21 near the beginning of a program before any motion occurs, and not to use either one anywhere else in the program. G28 uses the values in parameters 5161-5166 as the absolute values to make a rapid traverse move to from the current position. The parameter values are in terms of the absolute coordinate system and the machine's native coordinate system. G28 axes will make a rapid traverse move to the position specified by axes, then will make a rapid traverse move to the predefined position in parameters 5161-5166. G28.1 stores the current absolute position into parameters 5161-5166. G30 uses the values in parameters 5181-5186 as the absolute values to make a rapid traverse move to from the current position. The parameter values are in terms of the absolute coordinate system and the machine's native coordinate system. G30 axes will make a rapid traverse move to the position specified by axes, then will make a rapid traverse move to the predefined position in parameters 5181-5186. G30.1 stores the current absolute position into parameters 5181-5186. G30 parameters will be used to move the tool when a M6 is programmed if [TOOL_CHANGE_AT_G30]=1 is in the [EMCIO] section of the ini file. For spindle-synchronized motion in one direction, code G33 X- Y- Z- K- where K gives the distance moved in XYZ for each revolution of the spindle. For instance, if starting at Z=0, G33 Z-1 K.0625 produces a 1 inch motion in Z over 16 revolutions of the spindle. This command might be part of a program to produce a 16TPI thread. Note: K follows the drive line described by X- Y- Z- and is not parallel to the Z axis. Spindle-synchronized motions wait for spindle index, so multiple passes line up. G33 moves end at the programmed endpoint. All the axis words are optional, except that at least one must be used. All axis words are omitted. An unsynchronized move back to the original coordinate. Spindle-synchronized motions wait for spindle index, so multiple passes line up. G33.1 moves end at the original coordinate. Program G38.2 axes, G38.3 axes, G38.4 axes, or G38.5 axes to perform a straight probe operation. The axis words are optional, except that at least one of them must be used. The tool in the spindle must be a probe. the current point is the same as the programmed point. In response to this command, the machine moves the controlled point (which should be at the end of the probe tip) in a straight line at the current feed rate toward the programmed point. In inverse time feed mode, the feed rate is such that the whole motion from the current point to the programmed point would take the specified time. The move stops (within machine acceleration limits) when the programmed point is reached, or when the requested change in the probe input takes place. After successful probing, parameters 5061 to 5069 will be set to the coordinates of X, Y, Z, A, B, C, U, V, W of the location of the controlled point at the time the probe changed state. After unsuccessful probing, they are set to the coordinates of the programmed point. Parameter 5070 is set to 1 if the probe succeeded and 0 if the probe failed. If the probe failed, G38.2 and G38.4 will signal an error. A comment of the form (PROBEOPEN filename.txt) will open filename.txt and store the 9-number coordinate consisting of X, Y, Z, A, B, C, U, V, W of each successful straight probe in it. The file must be closed with (PROBECLOSE). Program G40 to turn cutter radius compensation off. The next move must be a straight move. It is OK to turn compensation off when it is already off. A G2/3 arc move is programmed next after a G40. G41 start cutter radius compensation to the left of the programmed line as viewed from the positive end of the axis perpendicular to the plane. 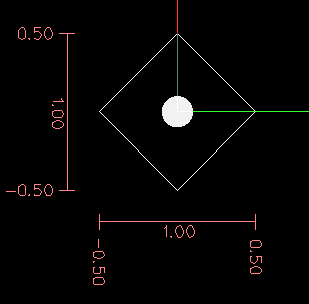 G42 start cutter radius compensation to the right of the programmed line as viewed from the positive end of the axis perpendicular to the plane. The lead in move must be at least as long as the tool radius and can be a rapid move. Cutter radius compensation may be performed if the XY-plane or XZ-plane is active. User M100- commands are allowed when Cutter Compensation is on. To turn cutter radius compensation on left (i.e., the cutter stays to the left of the programmed path when the tool radius is positive), program G41 D- . To turn cutter radius compensation on right (i.e., the cutter stays to the right of the programmed path when the tool radius is positive), program G42 D- . The D word is optional; if there is no D word, the radius of the tool currently in the spindle will be used. If used, the D number should normally be the slot number of the tool in the spindle, although this is not required. It is OK for the D number to be zero; a radius value of zero will be used. or cutter radius compensation is commanded to turn on when it is already on. To turn cutter radius compensation on left, program G41.1 D- L-. To turn cutter compensation on right, program G42.1 D- L-. The D word specifies the cutter diameter. The L word specifies the cutter orientation, and defaults to 0 if unspecified. For more information on cutter orientation see Section ([->]). the L number is not in the range from 0 to 9 inclusive. G43 and G43.1 change subsequent motions by offsetting the Z and/or X coordinates by the length of the tool. G43 and G43.1 do not cause any motion. The next time a compensated axis is moved, that axis's endpoint is the compensated location. To use a tool length offset from the tool table, program G43 Hn, where the n number is the desired index in the tool table. The H number will typically be, but does not have to be, the same as the slot number of the tool currently in the spindle. It is OK for the H number to be zero; an offset value of zero will be used. the H number is not an integer, is negative, or is larger than the number of carousel slots. To use a tool length offset from the program, use G43.1 Xn Yn ... Wn to set any axis tlo at run time. To use no tool length offset, program G49. It is OK to program using the same offset already in use. It is also OK to program using no tool length offset if none is currently being used. To move in absolute coordinates from the machine origin, program G53 on the same line as a linear move. G53 is not modal and must be programmed on each line. G0 or G1 does not have to be programmed on the same line if one is currently active. For example G53 G0 X0 Y0 Z0 will move the axes to the home position even if the currently selected coordinate system has offsets in effect. or G53 is used while cutter radius compensation is on. To select coordinate system 1, program G54, and similarly for other coordinate systems. The system-number-G-code pairs are: (1-G54), (2-G55), (3-G56), (4-G57), (5-G58), (6-G59), (7-G59.1), (8-G59.2), and (9-G59.3). The coordinate systems store the values for each system in the variables shown in the following table. one of these G-codes is used while cutter radius compensation is on. See Section [->] for an overview of coordinate systems. G61 visits the programmed point exactly, even though that means temporarily coming to a complete stop. G64 without P means to keep the best speed possible, no matter how far away from the programmed point you end up. G64 P- Q- is a way to fine tune your system for best compromise between speed and accuracy. The P- tolerance means that the actual path will be no more than P- away from the programmed endpoint. The velocity will be reduced if needed to maintain the path. In addition, when you activate G64 P- Q- it turns on the "naive cam detector"; when there are a series of linear XYZ feed moves at the same feed rate that are less than Q- away from being collinear, they are collapsed into a single linear move. On G2/3 moves in the G17 (XY) plane when the maximum deviation of an arc from a straight line is less than the G64 P- tolerance the arc is broken into two lines (from start of arc to midpoint, and from midpoint to end). those lines are then subject to the naive cam algorithm for lines. Thus, line-arc, arc-arc, and arc-line cases as well as line-line benefit from the "naive cam detector". This improves contouring performance by simplifying the path. It is OK to program for the mode that is already active. See also Section [->] for a discussion of these modes. If Q is not specified then it will have the same behavior as before and use the value of P-. The G73 cycle is intended for deep drilling or milling with chip breaking. The retracts in this cycle cut off any long stringers (which are common when drilling in aluminum). This cycle takes a Q number which represents a "delta" increment along the Z axis. Preliminary motion, as described above. Move the Z-axis only at the current feed rate downward by delta or to the Z position, whichever is less deep. Repeat steps 2 and 3 until the Z position is reached at step 2. Retract the Z-axis at traverse rate to clear Z.
the Q number is negative or zero. The R- degression value is less than 1.0. A line through the initial X position parallel to the Z. The "thread pitch" in distance per revolution. The final position of threads. At the end of the cycle the tool will be at this Z position. The "thread peak" offset from the "drive line". Negative I values are external threads, and positive I values are internal threads. Generally the material has been turned to this size before the G76 cycle. A positive value specifying the "initial cut depth". The first threading cut will be J beyond the "thread peak" position. A positive value specifying the "full thread depth". The final threading cut will be K beyond the "thread peak" position. The "compound slide angle" is the angle (in degrees) describing to what extent successive passes should be offset along the drive line. This is used to cause one side of the tool to remove more material than the other. A positive Q value causes the leading edge of the tool to cut more heavily. Typical values are 29, 29.5 or 30. The number of "spring passes". Spring passes are additional passes at full thread depth. If no additional passes are desired, program H0. Tapered entry and exit moves can be programmed using E- and L-. Specifies which ends of the thread get the taper. Program L0 for no taper (the default), L1 for entry taper, L2 for exit taper, or L3 for both entry and exit tapers. Entry tapers will pause at the drive line to synchronize with the index pulse then feed in to the beginning of the taper. No entry taper and the tool will rapid to the cut depth then synchronize and begin the cut. The tool is moved to the initial X and Z positions prior to issuing the G76. 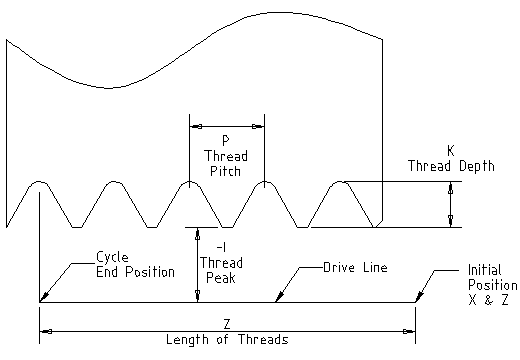 The X position is the "drive line" and the Z position is the start of the threads. The tool will pause briefly for synchronization before each threading pass, so a relief groove will be required at the entry unless the beginning of the thread is past the end of the material or an entry taper is used. Unless using an exit taper, the exit move (traverse to original X) is not synchronized to the spindle speed. With a slow spindle, the exit move might take only a small fraction of a revolution. If the spindle speed is increased after several passes are complete, subsequent exit moves will require a larger portion of a revolution, resulting in a very heavy cut during the exit move. This can be avoided by providing a relief groove at the exit, or by not changing the spindle speed while threading. The final position of the tool will be at the end of the "drive line". A safe Z move will be needed with an internal thread to remove the tool from the hole. The sample program g76.ngc shows the use of the G76 canned cycle, and can be previewed and executed on any machine using the sim/lathe.ini configuration. The tool is in the final position after the G76 cycle is completed. You can see the entry path on the right from the Q29.5 and the exit path on the left from the L2 E0.045. The white lines are the cutting moves. Axis words are programmed when G80 is active, unless a modal group 0 G code is programmed which uses axis words. The canned cycles G81 through G89 are described in this section. Two examples are given with the description of G81 below. All canned cycles are performed with respect to the currently-selected plane. Any of the six planes may be selected. Throughout this section, most of the descriptions assume the XY-plane has been selected. The behavior is analogous if another plane is selected, and the correct words must be used. For instance, in the G17.1 plane, the action of the canned cycle is along W, and the locations or increments are given with U and V. In this case substitute U,V,W for X,Y,Z in the instructions below. Rotational axis words are not allowed on the same line as a canned cycle. If rotational axis words are used while a canned cycle is active they must be on a seperate line and the numbers must be the same as the current position numbers so that the rotational axes do not move. Future versions of EMC will not allow rotational axis words while a canned cycle is active. All canned cycles use X, Y, Z, or U, V, W groups depending on the plane selected and R words. The R (usually meaning retract) position is along the axis perpendicular to the currently selected plane (Z-axis for XY-plane, etc.) Some canned cycles use additional arguments. For canned cycles, we will call a number "sticky" if, when the same cycle is used on several lines of code in a row, the number must be used the first time, but is optional on the rest of the lines. Sticky numbers keep their value on the rest of the lines if they are not explicitly programmed to be different. The R number is always sticky. 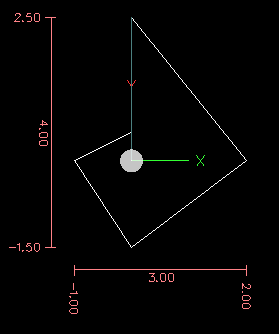 In incremental distance mode X, Y, and R numbers are treated as increments from the current position and Z as an increment from the Z-axis position before the move involving Z takes place. In absolute distance mode, the X, Y, R, and Z numbers are absolute positions in the current coordinate system. The L number is optional and represents the number of repeats. L=0 is not allowed. If the repeat feature is used, it is normally used in incremental distance mode, so that the same sequence of motions is repeated in several equally spaced places along a straight line. When L- is greater than 1 in incremental mode with the XY-plane selected, the X and Y positions are determined by adding the given X and Y numbers either to the current X and Y positions (on the first go-around) or to the X and Y positions at the end of the previous go-around (on the repetitions). Thus, if you program L10, you will get 10 cycles. The first cycle will be distance X,Y from the original location. The R and Z positions do not change during the repeats. The L number is not sticky. In absolute distance mode, L>1 means "do the same cycle in the same place several times", Omitting the L word is equivalent to specifying L=1. or cutter radius compensation is active during a canned cycle. or the R number is less than the Z number. If other planes are active, the error conditions are analogous to the XY conditions above. At the very beginning of the execution of any of the canned cycles, if the current Z position is below the R position, the Z-axis is traversed to the R position. This happens only once, regardless of the value of L.
a straight traverse of the Z-axis only to the R position, if it is not already at the R position. If another plane is active, the preliminary and in-between motions are analogous. The G81 cycle is intended for drilling. Move the Z-axis only at the current feed rate to the Z position. Example 1. Suppose the current position is (1, 2, 3) and the XY-plane has been selected, and the following line of NC code is interpreted. This calls for absolute distance mode (G90) and OLD_Z retract mode (G98) and calls for the G81 drilling cycle to be performed once. The X number and X position are 4. The Y number and Y position are 5. The Z number and Z position are 1.5. The R number and clear Z are 2.8. Old Z is 3. The following moves take place. Example 2. Suppose the current position is (1, 2, 3) and the XY-plane has been selected, and the following line of NC code is interpreted. This calls for incremental distance mode (G91) and OLD_Z retract mode (G98) and calls for the G81 drilling cycle to be repeated three times. The X number is 4, the Y number is 5, the Z number is -0.6 and the R number is 1.8. The initial X position is 5 (=1+4), the initial Y position is 7 (=2+5), the clear Z position is 4.8 (=1.8+3), and the Z position is 4.2 (=4.8-0.6). Old Z is 3. The first move is a traverse along the Z-axis to (1,2,4.8), since old Z < clear Z. The first repeat consists of 3 moves. The second repeat consists of 3 moves. The X position is reset to 9 (=5+4) and the Y position to 12 (=7+5). The third repeat consists of 3 moves. The X position is reset to 13 (=9+4) and the Y position to 17 (=12+5). The G82 cycle is intended for drilling with a dwell at the bottom of the hole. Dwell for the P number of seconds. The G83 cycle (often called peck drilling) is intended for deep drilling or milling with chip breaking. The retracts in this cycle clear the hole of chips and cut off any long stringers (which are common when drilling in aluminum). This cycle takes a Q number which represents a "delta" increment along the Z-axis. Rapid back out to the clear_z. Rapid back down to the current hole bottom, backed off a bit. Repeat steps 2, 3, and 4 until the Z position is reached at step 2. The G85 cycle is intended for boring or reaming, but could be used for drilling or milling. Retract the Z-axis at the current feed rate to clear Z. The G86 cycle is intended for boring. This cycle uses a P number for the number of seconds to dwell. Restart the spindle in the direction it was going. the spindle is not turning before this cycle is executed. This code is currently unimplemented in EMC2. It is accepted, but the behavior is undefined. The G89 cycle is intended for boring. This cycle uses a P number, where P specifies the number of seconds to dwell. Interpretation of G Code can be in one of two distance modes: absolute or incremental. To go into absolute distance mode, program G90. In absolute distance mode, axis numbers (X, Y, Z, A, B, C, U, V, W) usually represent positions in terms of the currently active coordinate system. Any exceptions to that rule are described explicitly in this Section [.]. To go into incremental distance mode, program G91. In incremental distance mode, axis numbers usually represent increments from the current coordinate. G90.1 Absolute Distance Mode for I, J & K offsets. G91.1 Incremental Distance Mode for I, J & K offsets. Returns I, J & K to their normal behavior. See Section [->] for more information on Offsets. When G92 is executed, the origins of all coordinate systems move. They move such that the value of the current controlled point, in the currently active coordinate system, becomes the specified value. All coordinate system's origins are offset this same distance. For example, suppose the current point is at X=4 and there is currently no G92 offset active. Then G92 x7 is programmed. This moves all origins -3 in X, which causes the current point to become X=7. This -3 is saved in parameter 5211. Being in incremental distance mode has no effect on the action of G92. G92 offsets may be already be in effect when the G92 is called. If this is the case, the offset is replaced with a new offset that makes the current point become the specified value. To reset axis offsets to zero, program G92.1 or G92.2. G92.1 sets parameters 5211 to 5219 to zero, whereas G92.2 leaves their current values alone. To set the axis offset to the values saved in parameters 5211 to 5219, program G92.3. You can set axis offsets in one program and use the same offsets in another program. Program G92 in the first program. This will set parameters 5211 to 5219. Do not use G92.1 in the remainder of the first program. The parameter values will be saved when the first program exits and restored when the second one starts up. Use G92.3 near the beginning of the second program. That will restore the offsets saved in the first program. EMC2 stores the G92 offsets and reuses them on the next run of a program. To prevent this, one can program a G92.1 (to erase them), or program a G92.2 (to remove them - they are still stored). G95 is Units per Revolution Mode. Three feed rate modes are recognized: units per minute, inverse time, and units per revolution. Program G94 to start the units per minute mode. Program G93 to start the inverse time mode. Program G95 to start the units per revolution mode. In units per minute feed rate mode, an F word is interpreted to mean the controlled point should move at a certain number of inches per minute, millimeters per minute, or degrees per minute, depending upon what length units are being used and which axis or axes are moving. In units per revolution mode, an F word is interpreted to mean the controlled point should move a certain number of inches per revolution of the spindle, depending on what length units are being used and which axis or axes are moving. G95 is not suitable for threading, for threading use G33 or G76. In inverse time feed rate mode, an F word means the move should be completed in [one divided by the F number] minutes. For example, if the F number is 2.0, the move should be completed in half a minute. When the inverse time feed rate mode is active, an F word must appear on every line which has a G1, G2, or G3 motion, and an F word on a line that does not have G1, G2, or G3 is ignored. Being in inverse time feed rate mode does not affect G0 (rapid traverse) motions. inverse time feed rate mode is active and a line with G1, G2, or G3 (explicitly or implicitly) does not have an F word. Two spindle control modes are recognized: revolutions per minute, and CSS (constant surface speed). Program G96 D- S- to select constant surface speed of S feet per minute (if G20 is in effect) or meters per minute (if G21 is in effect). The maximum spindle speed is set by the D- number in revolutions per minute. When using G96, ensure that X0 in the current coordinate system (including offsets and tool lengths) is the center of rotation or emc will not give the desired spindle speed. G96 is not affected by radius or diameter mode. Program G97 to select RPM mode. When the spindle retracts during canned cycles, there is a choice of how far it retracts: (1) retract perpendicular to the selected plane to the position indicated by the R word, or (2) retract perpendicular to the selected plane to the position that axis was in just before the canned cycle started (unless that position is lower than the position indicated by the R word, in which case use the R word position). To use option (1), program G99. To use option (2), program G98. Remember that the R word has different meanings in absolute distance mode and incremental distance mode. To pause a running program temporarily (regardless of the setting of the optional stop switch), program M0. EMC2 remains in the Auto Mode so MDI and other manual actions are not enabled. To pause a running program temporarily (but only if the optional stop switch is on), program M1. EMC2 remains in the Auto Mode so MDI and other manual actions are not enabled. It is OK to program M0 and M1 in MDI mode, but the effect will probably not be noticeable, because normal behavior in MDI mode is to stop after each line of input, anyway. To exchange pallet shuttles and then stop a running program temporarily (regardless of the setting of the optional stop switch), program M60. If a program is stopped by an M0, M1, or M60, pressing the cycle start button will restart the program at the following line. To end a program, program M2. To exchange pallet shuttles and then end a program, program M30. Both of these commands have the following effects. Change from Auto mode to MDI mode. Origin offsets are set to the default (like G54). Selected plane is set to CANON_PLANE_XY (like G17). Distance mode is set to MODE_ABSOLUTE (like G90). Feed rate mode is set to UNITS_PER_MINUTE (like G94). Feed and speed overrides are set to ON (like M48). Cutter compensation is turned off (like G40). The spindle is stopped (like M5). The current motion mode is set to G_1 (like G1). Coolant is turned off (like M9). No more lines of code in an RS274/NGC file will be executed after the M2 or M30 command is executed. Pressing cycle start will start the program back at the beginning of the file. To start the spindle turning clockwise at the currently programmed speed, program M3. To start the spindle turning counterclockwise at the currently programmed speed, program M4. To stop the spindle from turning, program M5. It is OK to use M3 or M4 if the spindle speed is set to zero. If this is done (or if the speed override switch is enabled and set to zero), the spindle will not start turning. If, later, the spindle speed is set above zero (or the override switch is turned up), the spindle will start turning. It is OK to use M3 or M4 when the spindle is already turning or to use M5 when the spindle is already stopped. The spindle will be stopped. The tool that was selected (by a T word on the same line or on any line after the previous tool change) will be in the spindle. The T number is an integer giving the changer slot of the tool (not its id). If the selected tool was not in the spindle before the tool change, the tool that was in the spindle (if there was one) will be in its changer slot. If configured in the .ini file some axis positions may move when a M6 is issued. See the EMCIO section of the Integrators Manual for more information on tool change options. No other changes will be made. For example, coolant will continue to flow during the tool change unless it has been turned off by an M9. The tool length offset is not changed, use G43 to change the tool length offset. The tool change may include axis motion. It is OK (but not useful) to program a change to the tool already in the spindle. It is OK if there is no tool in the selected slot; in that case, the spindle will be empty after the tool change. If slot zero was last selected, there will definitely be no tool in the spindle after a tool change. To turn mist coolant on, program M7. To turn flood coolant on, program M8. To turn all coolant off, program M9. It is always OK to use any of these commands, regardless of what coolant is on or off. To enable the spindle speed and feed rate override switches, program M48. To disable both switches, program M49. See Section [->] for more details. It is OK to enable or disable the switches when they are already enabled or disabled. These switches can also be toggled individually using M50 and M51 as described in the sections [.] and [.]. To enable the feed rate override switch, program M50 or M50 P1. To disable the switch program M50 P0. While disabled the feed override will have no influence, and the motion will be executed at programmed feed rate. (unless there is an adaptive feed rate override active). To enable the spindle speed override switch, program M51 or M51 P1. To disable the switch program M51 P0. While disabled the spindle speed override will have no influence, and the spindle speed will have the exact program specified value (using the S-word as described in [.]). To use an adaptive feed, program M52 or M52 P1. To stop using adaptive feed, program M52 P0. When adaptive feed is enabled, some external input value is used together with the user interface feed override value and the commanded feed rate to set the actual feed rate. In EMC2, the HAL pin motion.adaptive-feed is used for this purpose. Values on motion.adaptive-feed should range from 0 (feed hold) to 1 (full speed). To enable the feed stop switch, program M53 or M53 P1. To disable the switch program M53 P0. Enabling the feed stop switch will allow motion to be interrupted by means of the feed stop control. In EMC2, the HAL pin motion.feed-hold is used for this purpose. Values of 1 will cause the motion to stop (if M53 is active). To change the current tool number while in MDI or Manual mode program a M61 Qxx in the MDI window. One use is when you power up EMC with a tool currently in the spindle you can set that tool number without doing a tool change. To control a digital output bit, program M- P-, where the M-word ranges from 62 to 65, and the P-word ranges from 0 to a default value of 3. If needed the the number of I/O can be increased by using the num_dio parameter when loading the motion controller. See the Integrators Manual Configuration Section EMC and HAL section for more information. The P- word specifies the digital output number. The M62 & M63 commands will be queued. Subsequent commands referring to the same output number will overwrite the older settings. More than one output change can be specified by issuing more than one M62/M63 command. The actual change of the specified outputs will happen at the beginning of the next motion command. If there is no subsequent motion command, the queued output changes won't happen. It's best to always program a motion g-code (G0, G1, etc) right after the M62/63. M64 & M65 happen immediately as they are received by the motion controller. They are not synchronized with movement, and they will break blending. To read the value of an analog or digital input pin, program M66 P- E- L- Q- , where the P-word and the E-word ranges from 0 to 3. If needed the the number of I/O can be increased by using the num_dio or num_aio parameter when loading the motion controller. See the Integrators Manual Configuration Section EMC and HAL section for more information.Only one of the P or E words must be present. It is an error if they are both missing. The P- word specifies the digital input number. The E- word specifies the analog input number. WAIT_MODE_RISE - waits for the selected input to perform a rise event. WAIT_MODE_FALL - waits for the selected input to perform a fall event. WAIT_MODE_HIGH - waits for the selected input to go to the HIGH state. WAIT_MODE_LOW - waits for the selected input to go to the LOW state. The Q-word specifies the timeout in seconds for the waiting. If the timeout is exceeded, the wait is interrupt, and the variable #5399 will be holding the value -1. The Q value is ignored if the L-word is zero (IMMEDIATE). A Q value of zero is an error if the L-word is non-zero. Mode 0 is the only one permitted for an analog input. M66 wait on an input stops further execution of the program, until the selected event (or the programmed timeout) occurs. It is an error to program M66 with both a P-word and an E-word (thus selecting both an analog and a digital input).In EMC2 these inputs are not monitored in real time and thus should not be used for timing-critical applications. To control an analog output synchronized with motion, program M67 E- Q-, where the E word ranges from 0 to the default maximum of 3 and Q is the value to set. The number of I/O can be increased by using the num_aio parameter when loading the motion controller. See the "EMC2 and HAL" chapter in the Configuration Section of the Integrators Manual for more information on the Motion Controller. M67 functions the same as M62-63. See the M62-65 section for information about queuing output commands synchronized with motion. To control an analog output immediately, program M68 E- Q-, where the E word ranges from 0 to the default maximum of 3 and Q is the value to set. The number of I/O can be increased by using the num_aio parameter when loading the motion controller. See the "EMC2 and HAL" chapter in the Configuration Section of the Integrators Manual for more information on the Motion Controller. M68 functions the same as M64-65. See the M62-65 section for information about immediate output commands. To invoke a user-defined command, program M1nn P- Q- where P- and Q- are both optional and must be a number. The external program "M1nn" must be in the directory named in [DISPLAY]PROGRAM_PREFIX in the ini file and is executed with the P and Q values as its two arguments. Execution of the RS274NGC file pauses until the invoked program exits. Any valid executable file can be used. For example to open and close a collet closer that is controlled by a paraport pin using a bash script file using M101 and M102. Create two files called M101 and M102. Set them as executable files (typically right click/properties/permissions) before running EMC2. Make sure the paraport pin is not connected to anything in a hal file. O-codes provide for flow control in NC programs. Each block has an associated number, which is the number used after O. Care must be taken to properly match the O-numbers. O codes use the letter "O" not the number zero as the first character in the number like O100. Subroutines extend from a O- sub to an O- endsub. The lines inside the subroutine (the "body") are not executed in order; instead, they are executed each time the subroutine is called with O- call. Inside a subroutine, O- return can be executed. This immediately returns to the calling code, just as though O- endsub was encountered. O- call takes up to 30 optional arguments, which are passed to the subroutine as #1, #2, ..., #N. Parameters from #N+1 to #30 have the same value as in the calling context. On return from the subroutine, the values of parameters #1 through #30 (regardless of the number of arguments) will be restored to the values they had before the call. Parameters #1 - #30 are local to the subroutine. Subroutine bodies may not be nested. They may only be called after they are defined. They may be called from other functions, and may call themselves recursively if it makes sense to do so. The maximum subroutine nesting level is 10. Subroutines do not have "return values", but they may change the value of parameters above #30 and those changes will be visible to the calling code. Subroutines may also change the value of global named parameters. The "while loop" has two structures: while/endwhile, and do/while. In each case, the loop is exited when the "while" condition evaluates to false. Inside a while loop, O- break immediately exits the loop, and O- continue immediately skips to the next evaluation of the while condition. If it is still true, the loop begins again at the top. If it is false, it exits the loop. The "if" conditional executes one group of statements if a condition is true and another if it is false. The "repeat" will execute the statements inside of the repeat/endrepeat the specified number of times. The example shows how you might mill a diagonal series of shapes starting at the present position. The O-number may be given by a parameter or calculation. In O-words, Parameters (section [->]), Expressions (section [->]), Binary Operators (section [->]) and Functions (table [->]) are particularly useful. To call a separate file with a subroutine name the file the same as your call and include a sub and endsub in the file. The file must be in the directory pointed to by PROGRAM_PREFIX. The file name can include lowercase letters, numbers, dash, and underscore only. In the called file you must include the oxxx sub and endsub and the file must be a valid file. To set the feed rate, program F<n> where "n" is a number. The application of the feed rate is as described in Section [->], unless inverse time feed rate mode is in effect, in which case the feed rate is as described in Section [.]. To set the speed in revolutions per minute (rpm) of the spindle, program S- . The spindle will turn at that speed when it has been programmed to start turning. It is OK to program an S word whether the spindle is turning or not. If the speed override switch is enabled and not set at 100%, the speed will be different from what is programmed. It is OK to program S0; the spindle will not turn if that is done. the S number is negative. As described in Section [. ], if a G84 (tapping) canned cycle is active and the feed and speed override switches are enabled, the one set at the lower setting will take effect. The speed and feed rates will still be synchronized. In this case, the speed may differ from what is programmed, even if the speed override switch is set at 100%. To select a tool, program T<n>, where the <n> number is the carousel slot for the tool. The tool is not changed until an M6 is programmed (see Section [.]). The T word may appear on the same line as the M6 or on a previous line. It is OK, but not normally useful, if T words appear on two or more lines with no tool change. The carousel may move a lot, but only the most recent T word will take effect at the next tool change. It is OK to program T0; no tool will be selected. This is useful if you want the spindle to be empty after a tool change. or a T number larger than the number of slots in the carousel is used. On some machines, the carousel will move when a T word is programmed, at the same time machining is occurring. On such machines, programming the T word several lines before a tool change will save time. A common programming practice for such machines is to put the T word for the next tool to be used on the line after a tool change. This maximizes the time available for the carousel to move. Rapid moves after a T<n> will not show on the AXIS preview until after a feed move. This is for machines that travel long distances to change the tool like a lathe. This can be very confusing at first. To turn this feature off for the current tool change program a G1 without any move after the T<n>. Printable characters and white space inside parentheses is a comment. A left parenthesis always starts a comment. The comment ends at the first right parenthesis found thereafter. Once a left parenthesis is placed on a line, a matching right parenthesis must appear before the end of the line. Comments may not be nested; it is an error if a left parenthesis is found after the start of a comment and before the end of the comment. Here is an example of a line containing a comment: "G80 M5 (stop motion)". Comments do not cause a machining center to do anything. A comment contains a message if "MSG," appears after the left parenthesis and before any other printing characters. Variants of "MSG," which include white space and lower case characters are allowed. The rest of the characters before the right parenthesis are considered to be a message. Messages should be displayed on the message display device. Comments not containing messages need not be displayed there. A comment can also be used to specify a file for the results of G38.x probing. See section [.]. Often, general logging is more useful than probe logging. Using general logging, the format of the output data can be controlled. Opens the named log file. If the file already exists, it is truncated. If the log file is open, it is closed. The message “…” is expanded as described below and then written to the log file if it is open. Comments that look like: (debug, rest of comment) are the same as comments like (msg, rest of comment) with the addition of special handling for parameters. Comments that look like: (print, rest of comment) are output to stderr with special handling for parameters. Inside the above types of comments, sequences like #123 are replaced by the value of the parameter 123. Sequences like #<named parameter> are replaced by the value of the named parameter. Remember that named parameters will have white space removed from them. So, #<named parameter> is the same as #<namedparameter>.